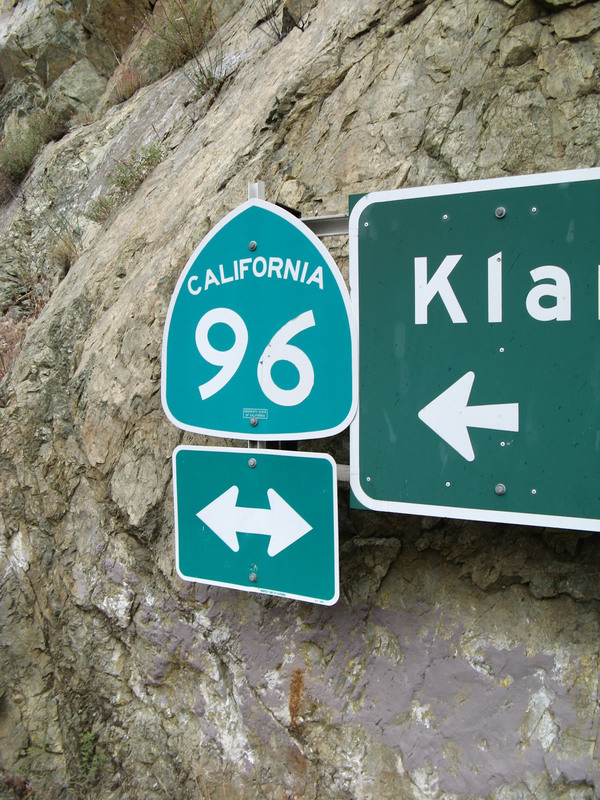 Closely following its namesake river through the Siskiyou Mountains, California 96 is the Klamath River Highway. The state route meanders from California 299 in Willow Creek in the south to a point north of Yreka, joining with Interstate 5 following a curving arc. Photo taken 05/25/08. California 96 follows the Trinity and Klamath Rivers on its course from Willow Creek (California 299) north to Interstate 5 near Hornbrook. Staying within these rivers' valleys, the highway serves recreational areas within the Klamath National Forest as well as the Hoopa Valley Indian Reservation, Weitchpec, Orleans, Clear Creek, Seiad Valley and Hamburg. A portion of the route is designated as the State of Jefferson Scenic Highway. The Randolph Collier Rest Area lies between Interstate 5 and the Klamath River at the east end of California 96. The facility serves travelers along both routes, and is the first for southbound motorists entering California from Oregon. Randolph Collier was a state senator and chairman of the California Senate Transportation Committee, who was instrumental in crafting the Collier–Burns Highway Act of 1947. This act established a role for the state in constructing urban freeways, increased gasoline and vehicle registration fees that were allocated to a highway revenue fund, and set a 55:45 ratio of state highway construction funds split between the southern half and northern half of the state respectively. Counties also received a guaranteed minimum amount of funding for road systems as part of the act.1 As a result of this historic act, which ushered in a new era of rural highway and urban freeway construction, Mr. Collier became known as the "Father of the California Freeways." Both this rest area and the Collier Tunnel on U.S. 199 are named in his honor. The Randolph Collier Rest Area hosts a small welcome center, which has maps, tourist brochures, and other information for Siskiyou County, with volunteers staffing the facility. Photo taken 05/25/08. Within the Randolph Collier Rest Area, a Blue Star Memorial Highway marker honors those who served in the Armed Forces while defending the United States of America. The Yreka Garden Club posted the sign. Photo taken 05/25/08. A plaque by the restroom building honors Randolph Collier, who passed away in 1983. Photo taken 05/25/08. Guide sign and shield assembly directing travelers from the Randolph Collier Rest Area back to Interstate 5 or to California 96 (State of Jefferson Scenic Byway) west. Photo taken 05/25/08. Second photo taken February 1999. Anderson Grade Road connects I-5 north at Exit 786 with both the Randolph Collier Rest Area and California 96 (Klamath River Highway) west. California 96 east merges directly onto I-5 north nearby. Photo taken 05/25/08. Eastbound California 96 at California 263 (Historic U.S. 99). The 1931 bridge visible to the right carried U.S. 99 over the Klamath River. Photo taken 05/25/08. Through traffic on California 96 east stops at the intersection with California 263 (Historic U.S. 99). Photo taken 05/25/08. Shields for SR 96 and SR 263 mounted into a cliff face at the intersection of the two state routes. SR 96 continues north to I-5. Photo taken 05/25/08. Mileage sign for Ashland, Medford, and Portland, Oregon via Interstate 5 north, posted after SR 263 on SR 96 eastbound. Photo taken 05/25/08. California 96 runs along the Klamath River northward 2.3 miles to I-5 by Sharps Gulch. Photo taken 05/25/08. Anderson Grade Road spans the Klamath River, linking SR 96 east with I-5 south and the adjacent Randolph Collier Rest Area. SR 96 concludes at a wye interchange with I-5 north to Ashland and Portland, Oregon. Photo taken 05/25/08. An end California 96 shield stands along the transition ramp to northbound Interstate 5. Photo taken 05/25/08. SR 96 branches west from I-5 and proceeds 2.3 miles south to intersect SR 263 (Historic U.S. 99). The State of Jefferson Scenic Byway overlays both state routes leading south and west. The state of Jefferson is an old proposal to carve a new state from the southern counties of Oregon and the northern counties of California. While this proposal never became a reality, it is a part of this region's history, especially since the areas of southern Oregon and extreme northern California have more in common than with either Portland or Los Angeles. Photo taken 05/25/08. California 96 proceeds alongside the Klamath River from California 263 toward Willow Creek. The scenic byway may close from time to time due to weather. Photo taken 05/25/08. Statewide Transportation Planning in California: Past Experience and Lessons for the Future. http://www.uctc.net/papers/658.pdf Brown, Jerry. Institute of Transportation Studies, University of California, Los Angeles, November 13, 2000.